Guitar Center, the world's largest retailer of musical instruments and equipment, and DirecTV, one of the world's leading providers of digital television entertainment services, will spotlight ALICE IN CHAINS in the award-winning music series Guitar Center Sessions on August 3 on DirecTV's Audience Network (Channel 239). Guitar Center Sessions features exclusive performances and intimate, enlightening conversations conducted by revered musical tastemaker Nic Harcourt. A clip of ALICE IN CHAINS performing the song "Would?" as part of Guitar Center Sessions can be seen below. 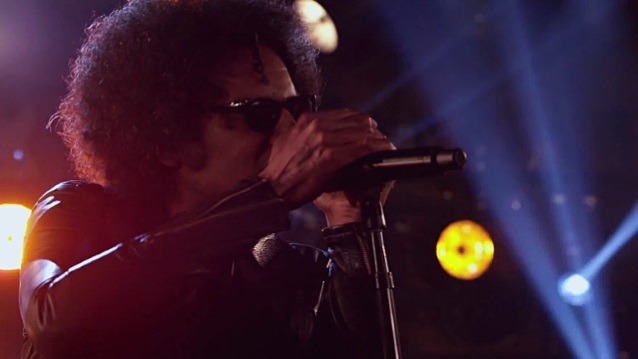 Guitar Center Sessions presented by JBL began airing Sunday, May 4. Now in its landmark eighth season, Guitar Center Sessions has been tuned into more than 15 million times since December, and is moving to an exciting new Sunday night time slot, airing inspiring performances each week at 8 p.m. exclusively on on DirecTV's Audience Network (Channel 239). It all kicked off with Seattle rock band SOUNDGARDEN performing songs that span their entire catalog. This episode, among others this season, was filmed live at South By Southwest (SXSW), on a rooftop perched high above the crowds with Austin's majestic skyline as a backdrop. "We are incredibly proud to present our viewers with yet another season of Guitar Center Sessions," said Dustin Hinz, director of music and entertainment marketing for Guitar Center. "Season 8 brings to life the stories, songs and journeys of a remarkable lineup of iconic and influential artists. Filming live at one of the world's biggest music festivals was the perfect way to celebrate both Guitar Center's 50th anniversary and the success Guitar Center Sessions has seen over the past 72 episodes." "DirecTV's Audience Network is honored to host another season of Guitar Center Sessions," said Chris Long, SVP original content and production, DirecTV. "We're excited to air an amazing showcase from this year's SXSW and to bring our customers another incredible lineup of talent in Season 8." "Guitar Center Sessions" captures exclusive live performances and interviews from noteworthy and influential artists in stunning hi-definition and 5.1 Surround Sound in Guitar Center's iconic location on Sunset Boulevard in Hollywood. In addition to show-stopping performances, each episode features intimate interviews conducted by renowned journalist Nic Harcourt, offering rare insights into the celebrated careers of these icons and the inspirations behind their music. "Guitar Center Sessions" is but one example of the music retailer's efforts to support artists by creating new avenues to expose their music to large audiences in an ever-changing music industry.